Stocks are at their all-time highs. Has the stock market topped out? I think so but I have been wrong for some time now. One thing I can say with some certainty is that relative performance makes this a good time to consider switching a little of your holdings from stocks to gold. You be the judge. 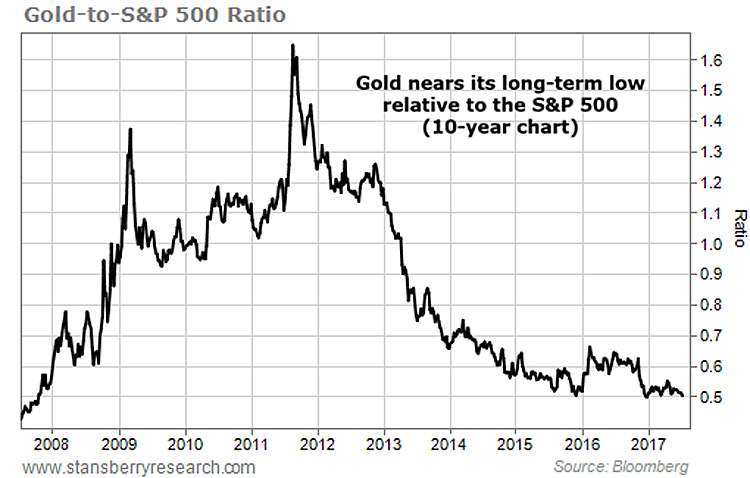 At the most basic level, this chart shows us that gold has dramatically underperformed stocks since 2011. This chart also tells us that gold is cheap relative to U.S. stocks. Over the past 10 years, the ratio’s average is 0.85. Going back further, over the past 20 years, the ratio’s average is 0.59. And over the past 40 years, the ratio’s average is 1.21. So at 0.50, gold is cheap relative to stocks. Is it time to consider a little diversification? It seems to me that there is very little downside risk in gold compared to stocks. But, dear reader, you could decide to double up on US stocks because they are performing so much better than gold. You know, buy momentum after nine years of going up and hope that trees actually do grow to the sky. Believe me when I tell you that’s the risky move, not the safe one.